Happy New Year to everyone, I am kicking off the new year with the One-Layer Simplicity Challenge No. 1 Restocking the shelves, well I am always in need of more cards for the men, (aren't we all lol). So here is my attempt, I have to say the OH My Goodness how scary is it to just put ink to card, I dithered around for ages, just in case I ruined that piece of white card, hahaha, it was a bit of a revelation and an experience, one which I will attempt to do more often. 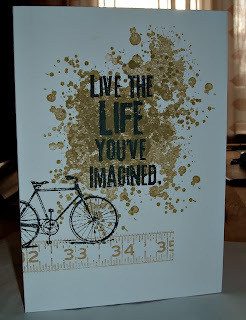 This card is totally inspired and to a degree copied from Marge McGuire in Stampers sampler Take Ten Winter issue, I think it worked well as one layer, I have made it with my partners Birthday in mind so the stamps used have specific meaning, like his age and our new bikes. It also looks a bit more green in real life. Corina, your card is fabulous! When you said it was inspired by the card in Take Ten, I knew exactly which one you were referring to, but I love your version better! Great card, and thanks so much for playing along with the OLS. Hope to see more of your work in the future!!! What a cool card! Hardly looks like only one layer! This is such a great card; I love the combination of images. It makes me want to go and make some cards for men which would be a good thing. The ratio of feminine to masculine cards in my stash is usually about 50:1!